“If you’re ready to stand against gun violence, let me hear you say, ‘I’m ready!’” he yells to a gathering crowd. 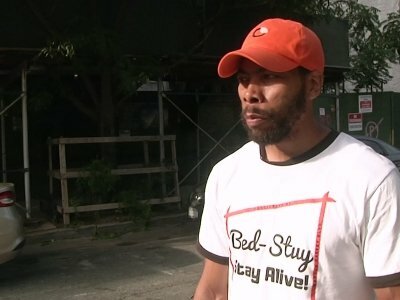 Gaskin staked out his spot in Brooklyn’s Bedford-Stuyvesant neighborhood because that’s where a 27-year-old man was shot three days earlier. His rally was part of the playbook for Save Our Streets (S.O.S), one of a growing number of taxpayer-financed “violence interrupter” groups in the nation’s largest city that enlist former gang members to attack shootings like outbreaks of a disease that they must keep from spreading. These troops mostly come from the ranks of each neighborhood’s former gang members, many of whom have served time for their crimes. There are currently 18 violence interrupter groups in high-crime areas across the city, with four more planned, part of Mayor Bill de Blasio’s plans to maintain historically-low rates of murder and gun violence while also improving the police’s relations with minority communities. Chicago, Baltimore and Philadelphia have similar groups. “It’s less and less the police who are discouraging bad behavior and more and more these organizations that are encouraging good behavior,” says Elizabeth Glazer, director of the Mayor’s Office of Criminal Justice, which has a $34 million annual budget to pay for these and other programs. Police similarly respond to a shooting by sending in extra officers, and violence interrupters coordinate with them precinct by precinct, although both are careful not to step on each other’s toes. Sometimes the police will step back to let them mediate a tense situation, but once the police move in, they don’t interfere. And perhaps most importantly, violence interrupters keep their relationships and conversations confidential from the police, so they can maintain the trust of the community. This year, both police and the violence interrupters are facing a particular challenge. Sixteen people between the ages of 10 and 18 have been killed in the city, already matching last year’s total. Since May, 15 percent of the homicide victims citywide have been 18 or younger. Among them was 15-year-old Lesandro “Junior” Guzman-Feliz, whose videotaped stabbing in June by a group of men outside a Bronx bodega shocked the city. In one section of northern Brooklyn, police say, four of the six killings last month involved victims and suspects 16 or younger, and all of the killings were connected to gang activity. Organizations like S.O.S. don’t see such killings as random occurrences that can’t be stopped. Instead, they are viewed as a consequence of a sequence of events — such as an argument that starts on a basketball court or a fistfight that leads to a shooting. These small fights turn deadly when they go unchecked, so the violence interrupters step in. Outreach workers go to the hospital immediately after a violent incident to comfort family members and make sure there’s no retaliation. Within 72 hours after a shooting, they hold a rally at the scene of the crime. With a bullhorn, chants, and signs, they wake the neighborhood up to the violence.